Stratford Are Champs at Nat Champs! Junior athletes from Stratford upon Avon Boat Club competed at the recent National Junior Rowing Championships held at the National Water Sports Centre. Day one of this three day event saw the Club’s J14 group competing first in the Omnium which tests their skills in small boats. All the athletes demonstrated their tremendous skills with a standout performance from Max Griffiths and Daniel Cox who finished seventh out of forty five crews. 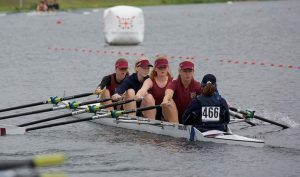 Then followed racing in the coxed quadruple sculling event. 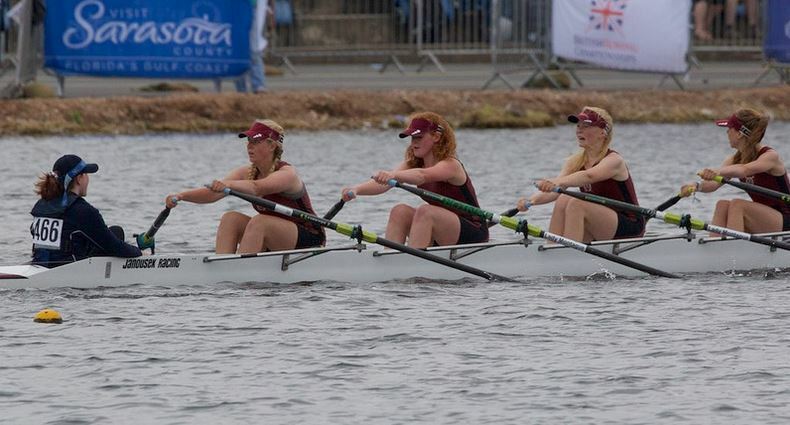 The boys crew of Fred Tyler, Sam McClenahan (Evesham), Max Griffiths and Daniel Cox steered by Katie Wellstead finished thirteenth out of the twenty eight crews entered. Theirs was an awesome performance recognised by the coach from the prestigious Henley Rowing Club who were beaten by half length. 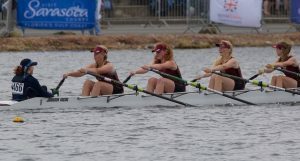 In another outstanding performance, the girls’ crew – Alice Baines, Nixie Brunt, Mya Kenny, Jasmine Mountney coxed by Mili Wilcock finished in twelfth place from a field of forty two crews. On day two, the older age groups took to the water competing first in a time trial over 1500 metres. The WJ15 double scull of Talei Dunn (very new to rowing) and Khloe Curnock missed their final by only six seconds, a great outcome at this stage of their rowing careers. Joseph Hodson competing in the J15 single sculls navigated the time trial successfully and finished fourth in the D Final rowed over 2000 metres. 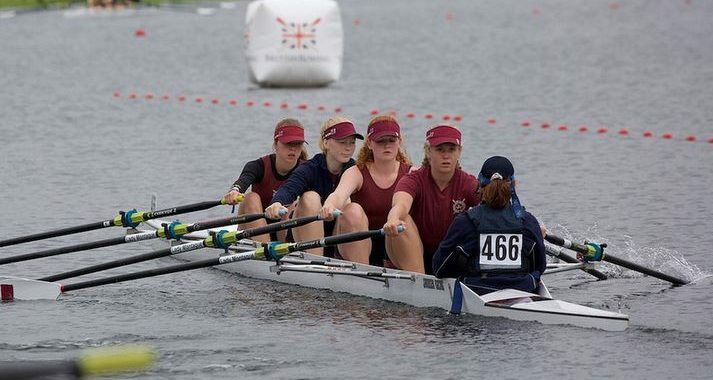 The WJ15 coxed quadruple sculling crew of Katie Wellstead, Katie Philips, Molly Gill-Swift and Jessica Wiesheu coxed by Mimi Hill, The WJ16 coxed four – Izzie Marsden, Autumn Keil, Lara Davies, Maddie Winsper and cox Matilda Watts and the WJ18 coxless quadruple scull of Sofia Ward, Lauren Willis, Maddie Griffiths and Theo Mordaunt all qualified for the semi-finals. 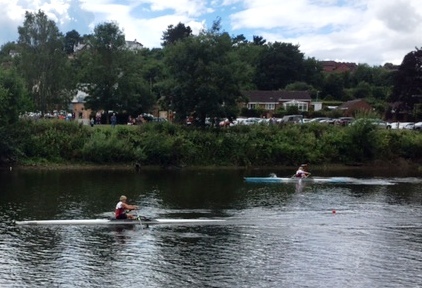 Whilst the Junior Squad were excelling at Nottingham, Stratford upon Avon Boat Club Masters’ crews descended upon the picturesque market town of Bewdley at the weekend for the famous and well attended Bewdley regatta held over two days on the river Seven. Saturday saw Stratford Women’s Masters crew of Kjersti Woolley and Vicky Brennan flying the flag in Women’s Novice double sculls over the long course. In a very close race against a much younger crew from Bristol Ariel, Stratford pushed them close but were just beaten on the finish by a length. Sunday saw the Stratford Masters men descend on Bewdley for the shorter sprints course, with the crew of Sarah Trowton (cox), Stephen Haighton, Tim Lunel, Simon Skillings and Wallace Brown in Masters D coxed fours. Their first race in the 50 to 55 age group event saw them take on a determined Stourport crew in a close fought race which saw Stratford pulling away to win by a length. A semi final soon followed against a Loughborough crew who again pushed Stratford hard but again failed to prevent another win by Stratford and a place in the final. The final saw Stratford up against the crew of the Monmouth double winners on the Saturday. 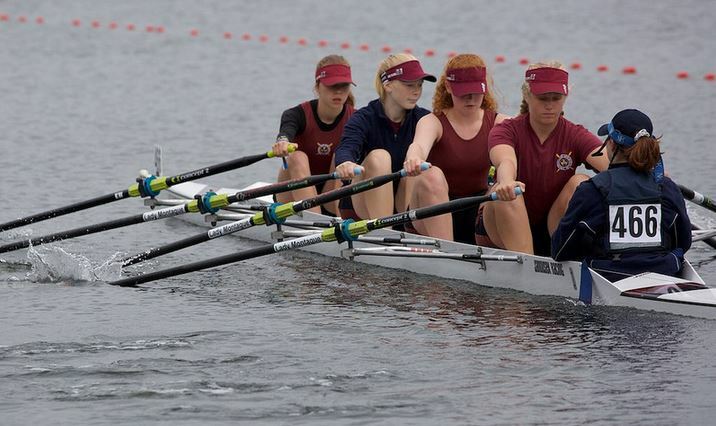 After a close start Monmouth’s high quality crew were able to pull away and lead Stratford by a length to record their third win of the weekend. Next up was Stratford Masters E crew is Lucy Breakwell (cox), Richard Shepherd, Simon Beard, Richard Nelson and Tom Doherty. Racing against another high quality Monmouth crew, Stratford got off to a shaky start which saw them half a length down which despite some strong pushes, they could not pull back and Monmouth were able to extend their lead to a length at the finish. The next race saw a scratch crew of Tom Doherty and Tim Lunel competing in the Masters D double sculls event against Stourport. With a crew change due to injury only two days before, the Stratford crew had no practice going into the event against a good quality Stourport crew. 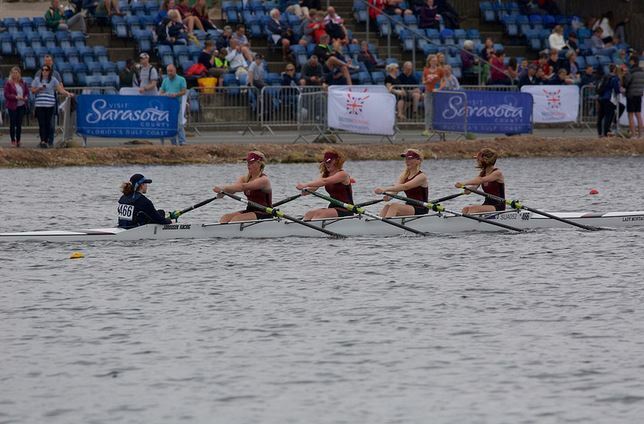 In a neck and neck race with the lead changing, the crowd were treated to a knife edge finish with only one foot separating a successful Stourport crew from Stratford. Stratford Tim Lunel was not finished and took part in his third event in Masters D single sculls against an experienced Stourport sculler. Another close race saw Tim pipped at the finish by a length. 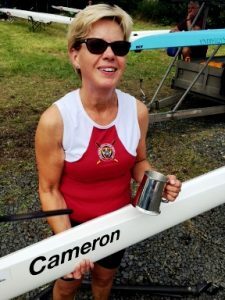 With no wins to record from the men, it took Kjersti Woolley, competing in her first single sculling race and fresh from her Saturday doubles race, to give herself a birthday treat with a final win over Helen Helliwell by a length and a half in an all Stratford final.